In May of 2009, The Prairie Spirit Trail was designated as the 26th State Park in Kansas. The trail runs from Iola to Ottawa and goes through the rural towns of Princeton, Scipio, Richmond, Garnett, Welda, Colony and Carlyle. The Iola City Council just approved $350,000 for the extension of the trail from Cofachique Park to Riverside Park. Picnic in the park, let the children play on the playground equipment, or climb on the army tank before you walk or bike the 50 mile trail, or just go a few miles. The trail is free inside the city limits, but there's a daily charge ($3.50) or yearly charge ($12.15) for a pass to continue. Instructions are on the pay box at the trail head at Cofachique Park or at any retail location where Kansas hunting, fishing and state park permits are sold. Most of the time, you will find others enjoying the beauty of rural Kansas, too, as the trail is open daily 365 days a year. The trail head is located at Cofachique Park on north State Street in Iola, across from the Kansas Army National Guard. 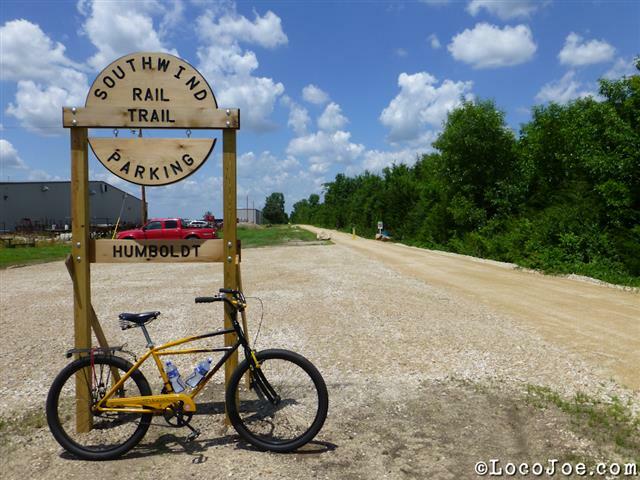 The Southwind Rail Trail opened in 2013 for recreation and active transportation use on a converted railroad corridor stretching between the small southeast Kansas cities of Iola and Humboldt. The trail is essentially a southern extension of the 51-mile Prairie Spirit Trail, which travels through Iola and a rural landscape farther north to the city of Ottawa. The trail begins at Iola's Riverside Park, which features baseball fields and a swimming pool. Shortly thereafter, the trail crosses Elm Creek on a restored railroad trestle. The rest of the journey to the outskirts of Humboldt is marked by a landscape of rolling hills and fertile farmland. 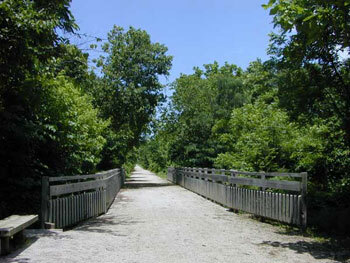 The Southwind Rail Trail was developed in large part through the efforts of Thrive Allen County, an active local nonprofit. In a first for Kansas, the local county commission also voted to help maintain and manage the trail. Watch for the new trail to open at the old Portland Cement Plant. The bridges are in now, and the path is being cleared.